About 120 militant Islamists have been arrested in Nigeria's north-eastern city of Maiduguri, as they were organising the burial of a commander, an army spokesman has said. The military has also recaptured five areas from the militants, he added. There has been no independent confirmation of what the army has said. President Goodluck Jonathan declared a state of emergency in three north-eastern states last week to quell the insurgency by the Boko Haram group. It has carried out a wave of bombings and assassinations since 2009, saying it wants to establish an Islamic state across Nigeria. A second Islamist group, Ansaru, joined the insurgency in 2012, taking foreigners hostage. Officials say some 2,000 people have fled to neighbouring Niger, while more have crossed into Cameroon, since the army launched its offensive in the states of Borno, Adamawa and Yobe last week. Some 2,000 soldiers were deployed to the region last week, in the biggest campaign to date against the Islamist militants. So far, this is war without pictures so it has not been possible to independently verify the military's upbeat account of the operation in remote areas of Borno State. The militants, we are told, are in disarray but it seems most are getting away as they are reported to be heading for the porous borders with Cameroon and Niger. Civilians have made it across, so the militants will too. The military is admitting that several of its own soldiers have been killed and injured - a sign of some resistance in the face of significant military might. The army says the group known as Boko Haram has scores of vehicles, some of which are mounted with heavy weapons - a surprising revelation pointing to a far better equipped outfit than anyone had earlier admitted. 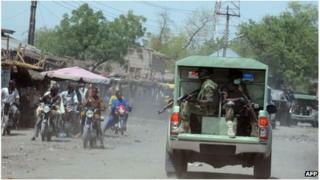 With a curfew and telecommunication links cut in Maiduguri, there are fears that civilians will be vulnerable to abuse by the army as it tries to find the Boko Haram fighters embedded within the population. The army has said it is also sending an extra 1,000 troops to Adamawa state. Militants fleeing towards neighbouring Chad and Niger are being "contained", military spokesman Chris Olukolade said, in a statement on Monday. "Advancing troops also observed a few shallow graves believed to be those of hurriedly buried members of the terrorist groups," he added. Brig Gen Olukolade said the 120 militants who were arrested were being interrogated, bringing to more than 200 the number of Islamists the army says it has arrested since last week. The militants were seized as they were preparing for the funeral of a commander killed in a battle with government troops, Brig Gen Olukolade added. The army had secured five towns and villages in remote parts of Borno state after "destroying all the terrorists camps" in the area, he said. The military said last week it had carried out air strikes, destroying militant bases in Sambisa game reserve, south of Maiduguri, and elsewhere. US Secretary of State John Kerry has urged the Nigerian army to show restraint and not violate human rights as it pursues the militants. Mr Kerry said there were "credible allegations" of "gross human rights violations" by the Nigerian military. Last November, Amnesty International accused Nigeria's security forces of carrying out widespread abuses in their campaign against Boko Haram, including extra-judicial killings, enforced disappearances and torture. More than 2,000 people have died in violence in Nigeria since 2010, most of which is blamed on Boko Haram. There has been growing concern that the group could be receiving backing from al-Qaeda-linked militants in other countries.